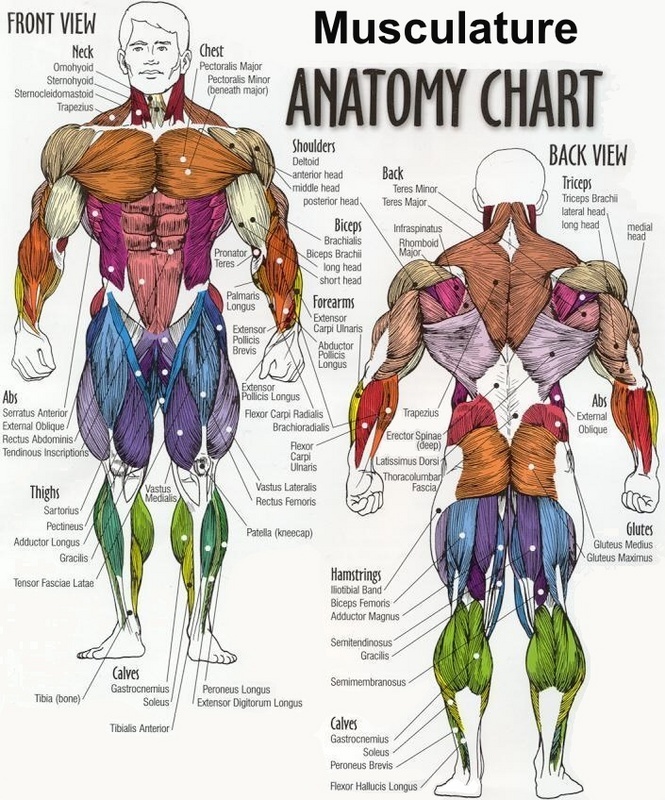 이 문서는 다른 언어판 위키백과의 문서(en:List of skeletal muscles of the human body)를 번역 중이며, 한국어로 좀 더 다듬어져야 합니다. 일반적인 인간에게는 대략 640개의 골격근이 있고, 대부분의 근육이 좌우대칭의 양측성 근육이므로 대략 320쌍의 근육을 이 문서에서 보여주고 있다. 그럼에도 불구하고, 정확한 숫자를 정하는 건 어려운데 왜냐하면 특정 근육을 단일 근육의 다른 부분으로 정의할지, 각각의 근육으로 정의할지 등의 문제가 있기 때문이다. 그래서 640개에서 850개로 근육의 숫자를 다르게 셀 수 있다. 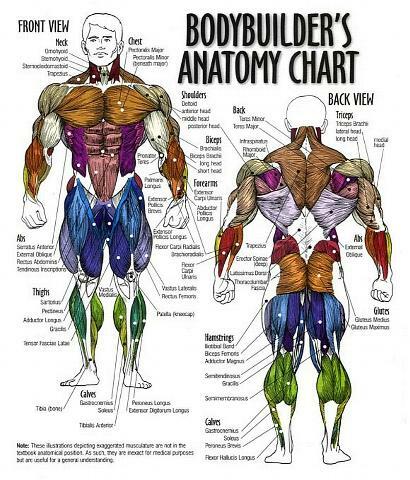 인체의 근육들은 머리와 목(head and neck)의 근육, 몸통(torso or trunk)의 근육, 팔(upper limbs)의 근육과 다리(lower limbs)의 근육을 포함한 많은 분류로 나뉠 수 있다. 표의 "동작"(action)은 해부학적 위치의 각각의 근육의 동작을 의미한다. 이 근육들은 해부학 용어(anatomical terminology)를 사용하여 설명된다. 한국어, 한자어, 영어 용어가 섞여서 쓰이는 대한민국 의학계의 현실을 감안하여 한국어, 한자어, 영어 명칭을 모두 표기하였다. 여기에 사용된 한국어 명칭들은 대한해부학회 사이트에서 배포하는 용어집을 따랐다. 또한 아직도 임상의학 의사들이 많이 쓰는 한자어로 된 명칭은 KMLE 의학 검색 엔진과 다국어 위키백과 등을 참고하였다. 인체 해부학에서의 골격근의 목록은 아래 표와 같다. 아래 표를 보기 전에 인체 뼈 목록, 위치에 대한 해부학 용어, 운동에 대한 해부학 용어, 근육에 대한 해부학 용어 문서를 읽으면 이해가 좀 더 쉬울 것이다. 위빗근(Superior oblique muscle) 눈확끝(orbital apex)과 시각신경관(optic canal) 안쪽(medial)의 온힘줄고리(Common tendinous ring) outer posterior quadrant of the eyeball lateral muscular branch of the ophthalmic artery trochlear nerve 주: 안쪽돌림(intorsion). 볼근(Buccinator muscle) alveolar processes of the maxillary bone and mandible, pterygomandibular raphe in the fibres of the orbicularis oris buccal artery buccal branch of the facial nerve compress the cheeks against the teeth (blowing), mastication. sensory: cervical plexus Acting alone, tilts head to its own side and rotates it so the face is turned towards the opposite side. Acting together, flexes the neck, raises the sternum and assists in forced inspiration. 턱두힘살근(Digastric muscle) anterior belly – digastric fossa (mandible); posterior belly - mastoid process of temporal bone Intermediate tendon (hyoid bone) anterior belly - mandibular division of the trigeminal (CN V) via the mylohyoid nerve; posterior belly - facial nerve (CN VII) Opens the jaw when the masseter and the temporalis are relaxed. 복장방패근(Sternothyroid muscle) manubrium thyroid cartilage Ansa cervicalis Depresses larynx, may slightly depress hyoid bone. 머리가장긴근(longissimus capitis muscle) articular processes of C4-C7; transverse processes of T1-T5 posterior margin of the mastoid process lateral sacral artery posterior branch of spinal nerve Laterally: Flex the head and neck to the same side. Bilaterally: Extend the vertebral column. 가시사이근육(Interspinales muscle) spinous process spinous process posterior rami of spinal nerves Extension, flexion and rotation of vertebral column. 배속빗근(Internal abdominal oblique muscle) inguinal ligament, iliac crest and the lumbodorsal fascia linea alba, xiphoid process and the inferior ribs. intercostal nerves T8, T9, T10, T11, subcostal nerve (T12), iliohypogastric nerve, ilioinguinal nerve Compresses abdomen and rotates vertebral column. 큰가슴근(대흉근, pectoralis major muscle) anterior surface of the medial half of the 빗장뼈(clavicle). As a whole, adducts and medially rotates the 위팔뼈(humerus). It also draws the 어깨뼈(scapula) anteriorly and inferiorly. 위팔두갈래근(상완이두근, biceps brachii muscle) 짧은갈래(short head): 어깨뼈(scapula)의 부리돌기(오훼돌기, coracoid process). 팔꿈치근(anconeus muscle) 위팔뼈의 가쪽위관절융기(Lateral epicondyle of the humerus) 팔꿈치머리(olecranon) 돌기의 가쪽과 자뼈(ulna) 뒷면의 위쪽 깊은위팔동맥(Deep brachial artery, Profunda brachii artery), 되돌이뼈사이동맥(recurrent interosseous artery) 노신경(radial nerve: 일곱째 목신경(cervical spinal nerve 7, C7), 여덟째 목신경(cervical spinal nerve 8, C8), 첫째 가슴신경(thoracic spinal nerve 1, T1)) partly blended in with the 위팔세갈래근(triceps), which it assists in extension of the forearm. Stabilises the elbow and abducts the ulna during pronation. 넙다리근막긴장근(tensor fasciae latae muscle) iliac crest iliotibial tract primarily lateral circumflex femoral artery, Superior gluteal artery Superior gluteal nerve (L4, L5) Thigh - flexion, medial rotation. Trunk stabilization. 무릎관절근(articularis genus muscle) 넙다리뼈(femur) suprapatellar bursa femoral artery femoral nerve Pulling the suprapatellar bursa during extension of the knee. 이 문서는 2019년 2월 11일 (월) 19:04에 마지막으로 편집되었습니다.